All of us want to live a healthier life and look good till we die, no? At least that’s the case with me. I want to keep myself as fit as I can, and want to make sure that I look good too. Health and Beauty is something that, I am most concerned about. I have adopted healthy living practices, make sure I eat right and, also take good care of myself. I used to read lots of health and beauty tips, but never applied those remedies, till a few years ago. I was the laziest person in my family, and some time a subject of lighter jokes about my weight, pimples and habits of sleeping till late hours. And then I decide to change it all. And here I am. But you know what is difficult? Instead of sleeping till late hours, get up early. The point is to read and then apply it n your everyday life. And when you do so continuously, week after week, you see the good results and end up adopting healthy living lifestyle. 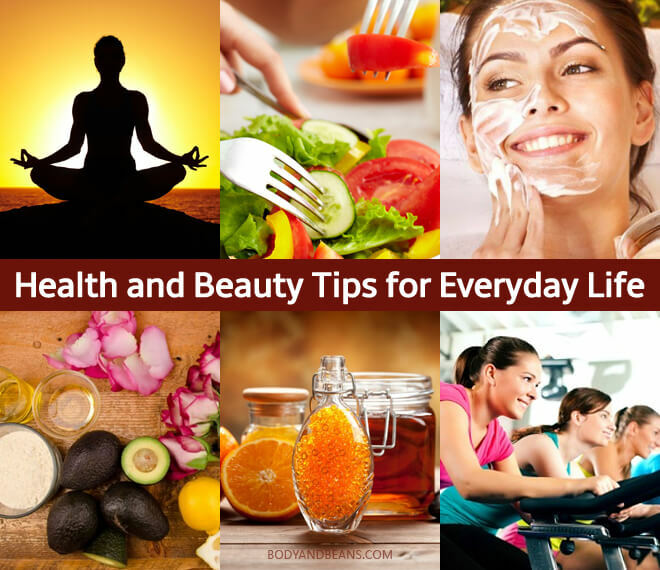 Based on my personal learning and experiences, I am happy to share this super compilation of health and beauty tips that you can use to live a healthier and happier life. You love your body, and hence it is seriously important to take a good care of yourself. There are a few physical and psychological changes that we all have to go through. Our health, skin, hair and the entire body requires attention. And thankfully, it is not that difficult to take good care of your-self. All that you need is to know a few essential health and beauty tips and adopt the healthy living practices. 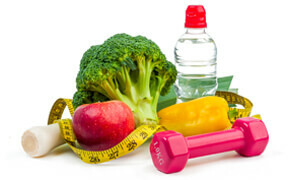 You may have to give up a few bad practices and adopt healthy lifestyle and you are sorted. The health and beauty tips mentioned here are not in any specific order. But instead of following all of it together, try adopting one at a time. For example, start getting up early for a week and you will become a morning person. Similarly, start going for a walk and may be taking honey and lime juice and subsequently, try more tips. Healthy living is a way of life. Adopt it and thank me later. Jogging, brisk walking or morning walk daily will help you to have a fit body, healthy mind and energetic all day. Mix honey and lime juice in lukewarm water. Drink it daily before breakfast in empty stomach, it improves digestion and helps in weight loss. Drink aloe vera juice daily (empty stomach) in the morning to cure constipation and it has many other benefits. Eat healthy breakfast, everyday. Take seasonal fruits and milk in breakfast instead of the oily foods like parathas. Replace the packaged fruit juice with fresh seasonal fruits. An apple a day keeps the diseases at bay. Chew 12-15 raw tulsi leaves everyday for it improves digestion and detoxify your body. Use double toned or skimmed milk daily. Drink carrot juice everyday to reduce mental stress and constipation. Jogging and morning walk helps in fighting stress and depression. Surya Namaskar is important daily as it takes care of your health from all aspects. Devote at least an hour to free hand exercises and yoga. Add bananas in your diet as it can cure constipation and also is a complete diet source in itself. Avoid the intake of cold drinks as much as you can. When you are thirsty, drink water and not cold drinks. Do not drink cold water under the sun, or immediately after coming home from in scorching summer. Drink water in normal temperature. Drink lots of water to keep your body hydrated. Keep an onion in your pocket, it prevents heat strokes. The smell of tulsi or holy basil is strong and also nice. You can inhale the scent of the leaves or massage the skull with basil oil, to get relief from migraines and headaches. Reduce the intake of raw salt in foods and salads, especially when you have cholesterol and high blood pressure. Drink 7-8 liters of water every day. Do not drink it at one go; sip it gradually throughout the day. If you have caught cold, then drink tea with ginger extracts, it can give instant relief. Drink green tea twice a day. It helps in reducing weight. Choose to take stairs instead of the elevators, when you have both the options. Cut the intake of junk foods and instead grab homemade meals. Do not consume the packaged readymade foods as they have high percentages of additives and preservatives. Enjoy all your favourite foods, but check the portion. If you like something, then do not go on eating in huge quantities. Do not drink water while you are having meals; drink 30 minutes before meal, and after 45 minutes of having meal. If you are working in computers and laptops for 10 hours a day, then it is highly strenuous. Close your eyes for one minute, at an interval of 30 minutes and let it relax. If you are suffering from diabetes, then eat cucumber daily as it helps in curing diabetes. Take you meals in smaller plates so that you can avoid having excess. Have a glass of milk everyday as it is rich in calcium and vitamins. Have at least one meal of your day with your family; dinner is the most suitable one though! Cut the intake of sugar in tea, coffee and other beverages. Instead use honey for sweetening, or the sugar free globules available in the market. Include dal (lentils, peas or beans), salad and curd every day, as these are loaded with nutrition. Do not drink excess in parties, check the limit. Have an egg daily to improve your immune system. If you have high cholesterol, then you must consult doctor before including egg in your diet. Have your meals on time. If you have cuts, then apply some turmeric powder on it. It will stop the bleeding, and also prevent any kinds of infection. Trim your fingernails frequently as these nails can be a source of germs, and these germs can enter in your system while having meals. Consume 5-10 dates everyday as they are too nutritious and an effective source of energy. Listen to your favourite songs daily for sometimes, music helps us to have a healthy mind. When having toothaches, take a cup of warm water and add some salt to it. Wash your mouth with it multiple times in a day. Don’t read while lying down, as this can lead to negative powers in your eyes. Chew your foods well before swallowing for better digestion. Do not deep fry the vegetables as this destroys their nutritional values. Prepare fruit juice at home by using the fresh seasonal fruits, do not depend blindly on the products of the market. Use pressure cooker while cooking, as this requires less oil, less gas, and also the food is cooked faster. Drink warm water after meal to enhance digestion. If you have any addiction like smoke or drink, then it is high time to reduce the intake and finally stop it completely. Chewing mint or gum reduces the urge to smoke. You can try this if you want to reduce the smoking addiction. Have lighter dinner; stop eating when you are 80% full. Do not have heavy dinner. Do not sleep immediately after dinner; give a gap of 1 to 2 hours before you hit the bed. Finish your dinner by 8.30 PM. Sit in Vajrasana position for 15-20 minutes after dinner. It helps in digesting food and reducing belly fat. Read your favourite story book or novel before going to bed. Switch off your phone and your entire gadgets before you go to bed. Scrolling your twitter feeds won’t do you much help. Sound sleep is essential to your health and well being, but don’t sleep for long hours. Started workout or improved eating habits? Don’t be too concerned about the results. Continue, give your best, enjoy it and result will be evident. Use pure lemon extracts for curing sun tan, it is a powerful bleaching agent. Cut the cucumber in circular way, and place the pieces on the eyes. Keep for 10 minutes. Doing this every day will cure the dark circles. To clean the ear wax, use two to three drops of mustard oil in to the ear. Apply the fresh aloe vera juice in your scalp; keep for 10 minutes, then wash. It promotes hair growth. Apply some aloe vera juice on your acne to cure it and also prevent it from occurring in future. Take some 15-20 guava leaves, and boil it. Use this water as conditioner after shampoo. Keep it for 10 minutes and wash it in cold water. Make a paste with raw egg and honey; apply it all over your scalp. Keep it for 30 minutes and then wash it. It reduces hair fall and also increases hair growth. To cure pimples, apply honey on the spot, and leave it overnight. For removing the marks on the skin, you can use the sandal paste, keep it for 15 minutes and then wash it. Use the aloe gel or aloe extracts to remove the scars and stretch marks. Make a paste of sesame seeds, turmeric and cow milk. Apply the paste on your skin, let it dry and then wash it. Drinking lots of water can prevent the pimples and acne. In winters, when your skin gets dry, apply aloe juice and honey on the dry areas. Take the ripe papayas, which are orange or yellow in colour, take a slice and apply it all over your face and other expose areas to reduce the suntan and dryness. If you have rashes, which are quite common in summers, a paste of neem leaves is too beneficial. Rinse hair with beer or vinegar to make it look glossy and silky shine. Rub the face with ice cubes to prevent the accumulation of fat, acne and wrinkles on your face. If you have developed eye bags, or puffy eyes, then de puff your eyes with slices of raw potatoes. Wash your face regularly before going to bed. The clean pores on the skin need to be cleaned for air circulation. Use hair brush and not plastic combs to improve the condition of hair. Brush hair from roots to ends. Use sunscreen lotions always to protect your skin from the harmful UV rays. Don’t pop pimples as there can be deep mark left on the skin. Trim your hair every month to reduce the hair fall. Apply a mixture of coconut oil and castor oil on your scalp, leave it at the night, and wash it the next morning. It increases the hair growth. Washing your face with slight lukewarm water can clean all the dirt and impurities. Rub the banana skin on your face, neck and hands for a glowing skin regularly. Apply body olive oil before or after shower for preventing skin dryness and itchiness. Wash the face with rose water at least once a day to prevent the pimples and acne. Instead of rubbing your face with any cloth, use a soft sponge as the skin on your face is most delicate. For preventing the body odor, mix fresh lemon juice in bathing water. Rub the neck, hands, and armpits, with lemons to reduce the body odor, and also reduce the tan. The orange pill is another natural scrub which you can apply thrice a week. Having fruits and vegetables in your diet can detoxify your body and thus give an inner glow. Devote one day in a week to live on fruits and toned milk only. This habit can help you maintain your body weight easily. Make paste of tulsi leaves, neem and aloe vera gel, apply it on the face if you have serious acne problem or skin rashes. If your skin is having large pores, then tie an ice cube in a handkerchief and rub the face gently. Make an apple juice, and apply it on the face with a cotton wool. Keep it for 10 minutes, and then wash it off, for instant glow. Wash your face as many number of times as you can, this is how you can prevent the growth of pimples permanently. The pimples occur due to oil and dirt. Keep you face clean by washing with cold water. Last but not the least, do not forget to laugh and smile, and enjoy each day of your life as it its last. When we adopt healthy living habits, it takes care of our health and body. The most common lifestyle and ageing related issues like diabetes, cholesterol, blood pressure, fatigue, stress, depression, obesity, ageing and other skin problems like acne and pigmentation can be dealt with basic remedies, and by adopting healthy lifestyle. All it takes is the determination and commitment yourself. Explore the health and beauty tips we discussed above, try and adopt one at a time and live a healthier and happier life. What else do you think one can do, to take care of health and wellness?